Euro-Chess 2016 - De website van euro-chess! 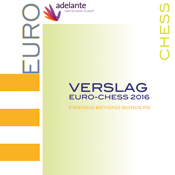 Euro-Chess 2016 and the theme is “Friends beyond borders”. non-formal learning: the participants come into contact with the cultural heritage of the Netherlands (especially the triangle Maastricht-Luik-Aken or Euregio Maas-Rijn) and several traditions of our country such as its manners and the specific customs (for example the language, the food and drinks of our region). By means of acquaintance workshops, presentations of their own countries and daily activities and frequent evaluations the youngsters make contact with each other and their different customs. So they discover each others differences. They learn to accept each other; similarities and differences will be inserted constructively. So a process of growth will develop from orientation through acquaintances to result into further social contact. Finally the participants of the several countries will show the characteristics of their country through music, drama, culinary art, folk dance, photography and a powerpoint presentation. Before, during and after Euro-Chess 2016 different social media (Facebook and YouTube) will be used to get in contact with each other, to make the weekly program and to propose ideas and suggestions.